Odyssey has made some of the most-successful putters in the history of the game, and this mallet model is likely to follow in that path. 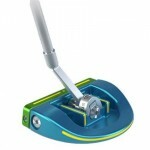 The Odyssey Works Versa putter comes in a couple of different styles, each of which has its own benefits to be enjoyed. 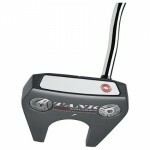 This review is going to focus on the Marxman Fang model, which is a large mallet-style putter that features a long stripe running down to the top of the putter head. It is that stripe that will be the first thing you notice when you look down from address. Obviously, the stripe is meant to aid in your alignment with the target line, and it will do a good job for most players. Odyssey has provided a dramatic contrast between the stripe and the rest of the head, so your eyes will instantly grab on to that feature. If you are a player who has historically struggled with your alignment on the greens, there is a good chance that the Works Versa Marxman Fang will help you get pointed in the right direction. 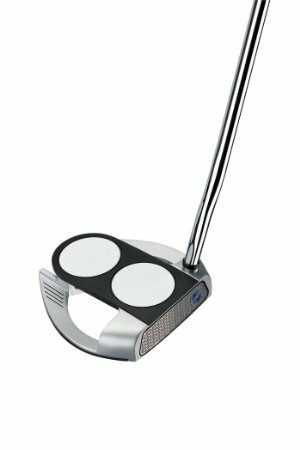 As with any mallet putter, it is really the perimeter weighting that makes this model of interest to the golfer looking to hole more putts. That perimeter weighting should help you hold the club head steady through the stroke, meaning you will be able to hit the target line more frequently. No putter can do all of the work for you, but the stability offered from the Works Versa should leave you feeling more confident than ever – especially on the short putts that you absolutely need to make. To add this putter to your bag, you are likely going to need to spend around $200. That is a price tag which puts this putter in the same general range as most of the brand name mallet putters on the market today. Given the reputation for quality and performance that has been built by the Odyssey brand over the years, most golfers will find that $200 is a fair price to pay.